I caught this story being posted, and asked for permission to blog it – it’s pretty harrowing. 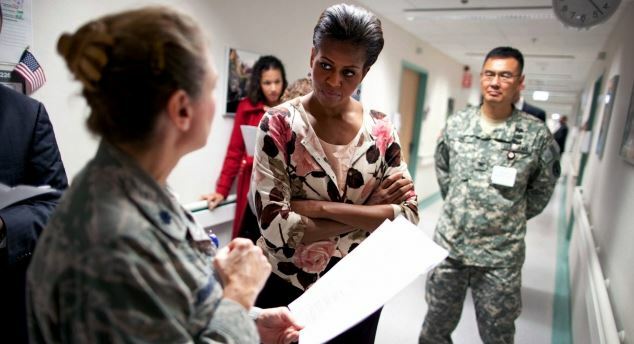 It purports to be a recounting of a hastily thrown photo op for Michelle Obama to stand in front of wounded soldiers from Walter Reed hospital. According to the account, they were forced to dress in their uniforms, and were told the event would include an awards ceremony and a luncheon. Neither were conducted, but the soldiers were made to sit, some suffering dehydration due to their medications, while Michelle reportedly waltzed in, took some pictures and hurriedly ran out. UPDATE: Kristinn Taylor of Free Republic sent me a link to what appears to be pictures from the event – the details seem to match the story, so I’ve added a few. In the photos, nearly all of Michelle are of her and her flunkies, including Hilda Solis, the outgoing Labor Secretary.
.@az_susan She told the soldiers and caregivers from Walter Reed they were receiving an award and having a luncheon. Neither one existed. In light of Michelle Obama using hungry school kids as props, let me tell you a story about some wounded soldiers it happened to last year. The following was told to me by the wife of a double amputee who was wounded in Afghanistan, and recovering at Walter Reed. The award ceremony would be a luncheon at the Dept of Labor with Michelle Obama, and their wounded husbands would need to attend as well. Despite the fact many wounded amputees were still hospitalized and had IVs and PICC lines, they were told they had to find dress uniforms. The found uniforms and got them onto the wounded troops best they could. Unit crests, patches, tabs and awards were a bit half hazard. 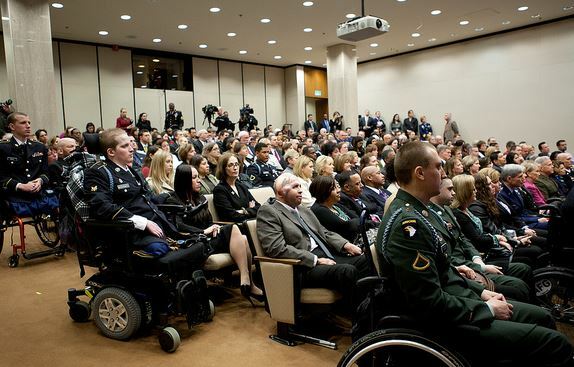 The day of the event the wounded warriors and wives were bused from Walter Reed to the Dept of Labor for the award ceremony and luncheon. After waiting around a while at Dept of Labor they found out there was no award ceremony, or luncheon. They couldnt even get water to drink. Do they look excited to be there? The wounded warriors and wives were nothing more than props for Michelle Obama to announce a new pet program of hers. No awards, no lunch. The details in the picture fit – wounded warriors dressed up for her appearance. They don’t look terribly happy. Michelle Obama ducked in, gave a speech, grandstanded for the media, took a quick photo or two, then left as fast as she arrived. Only one photo shows Michelle actually taking a picture with a soldier – and it’s across a barrier between her and the soldiers. The wounded warriors and wives from Walter Reed had done their jobs as props for Michelle Obama and were taken back to the hospital. If Michelle Obama has the moral depravity to use wounded troops as props, dont be surprised she does it to a few school kids too. FYI, the person who told me that story stressed they are a big fan of Barack and Michelle Obama, and voted for him. The thing about this story is that it confirms what many conservatives suspect – but will liberals just ignore it? 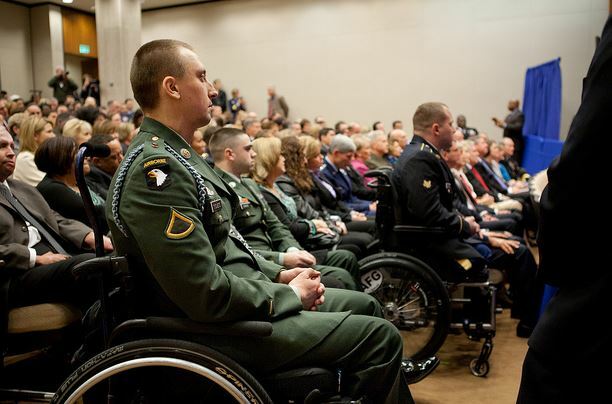 The military is respected far beyond nearly any other institution among Americans. Unfortunately, too many of our warriors’s opinions are stifled by military customs and laws. 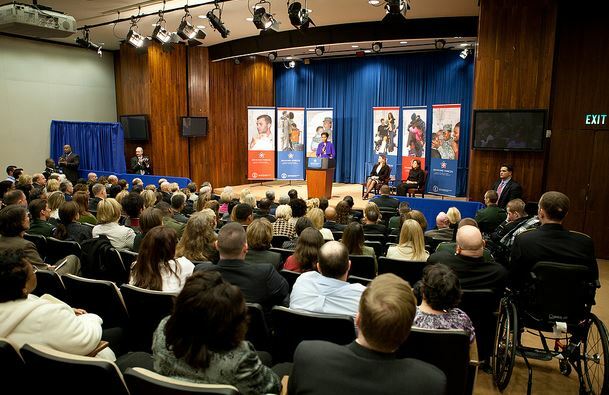 “We want to recognize the extraordinary dedication, sacrifice and service of our nation’s caregivers, not simply with words, but with deeds,” the first lady told the audience gathered at the Labor Department in Washington, D.C. This would fit the description that the wounded veterans were bussed from the hospital instead of having Michelle make the incredible effort of going to Walter Reed Hospital. How many of these things are they made to go to, and why can’t she just go to the hospital? The writer also added, “As I listened from the back of the packed auditorium…” as if they were there of their own volition.